Expect Invitation To Form Government Today, Says Team Sasikala. 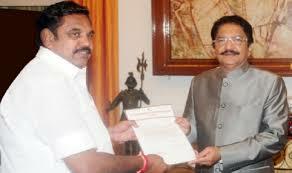 CHENNAI: A team led by Edappadi Palanisamy, handpicked by VK Sasikala as the AIADMK's presumptive Chief Minister, met Tamil Nadu Governor C Vidyasagar Rao on Wednesday evening and said it expects him to invite them today to form government in the state. The Governor later met O Panneerselvam, who too has staked claim to the top post. Ms Sasikala has reached Bengaluru, where she will spend the next four years in jail, after the Supreme Court convicted her in a corruption case stomping out her attempt to become the next Chief Minister. Prison authorities have made it clear that Ms Sasikala will merit no special privileges during her stay in jail. As she arrived in a big convoy, a few people gathered to watch, a stark contrast from 2014; thousands of AIADMK workers had gathered when she was last imprisoned along with J Jayalalithaa, the powerful matriarch of the ruling AIADMK who died while she was Chief Minister in December.